Are we witnessing the beginning of the end for democracy? No, I think that’s too pessimistic. But new challenges in the information age, the long-term decline of trust in elected governments and the increase in citizen involvement all mean that democracy must adjust. Democracy has its problems, but then it always has, even in ancient Greece. And of course, there was a period in the 1930s when there was a widespread belief that democracy was finished as a form of government and that fascism and communism would prevail, so I think it’s premature to see the end of democracy at this moment in time. 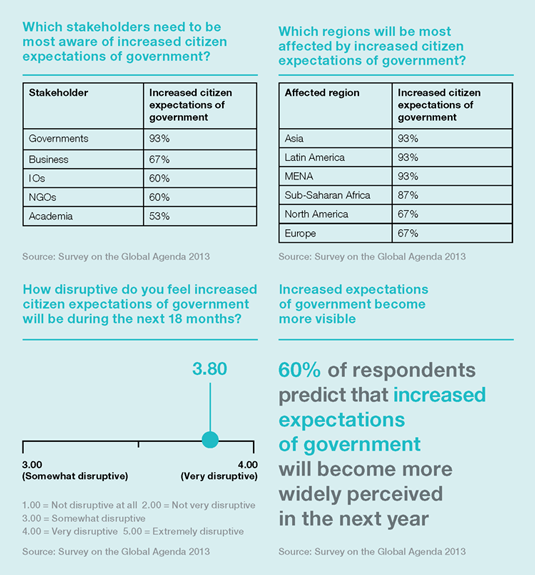 Respondents to the Survey on the Global Agenda signalled a change in the expectations they have of governments. The data links the failures of democracy to a broader failure of the institutions that govern political, economic and social life. And interestingly, the Survey also points to an increase in citizen involvement as a risk factor for democracy. We’re seeing a long-term decline in trust in many institutions, including corporations, governments and religious institutions, but one of the greatest trends of the 21st century is the diffusion of power from state to non-state actors. The internet has given a significant proportion of the population access to more information at lower costs than ever before. This means that governments and traditional hierarchies will have increasing difficulty in getting things done, unless they adapt to more networked procedures and more horizontal structures. But we have to remember that we’re not talking about machines here – political and social institutions can’t keep pace with Moore’s Law and the increase in computing power, so there’s a dialectic between those new empowered actors and traditional institutions. That’s why we can see protesters gather in Tahrir Square using social media to demand change, and just months later a military coup overthrows a democratically elected leader. But then we have to take a long-term view on all this and even the term ‘Arab Spring’ suggests seasonality. We should really be talking about an ‘Arab Revolution’ and revolutions take decades to work themselves out – just look at the French Revolution, which started in 1789 and didn’t come to an end until the Congress in Vienna in 1815. Even then the result was a reassertion of traditional authority, so while the French Revolution unleashed an enormous tower of ideas that spread throughout Europe, you have to take the century-long perspective to say that it prevailed.